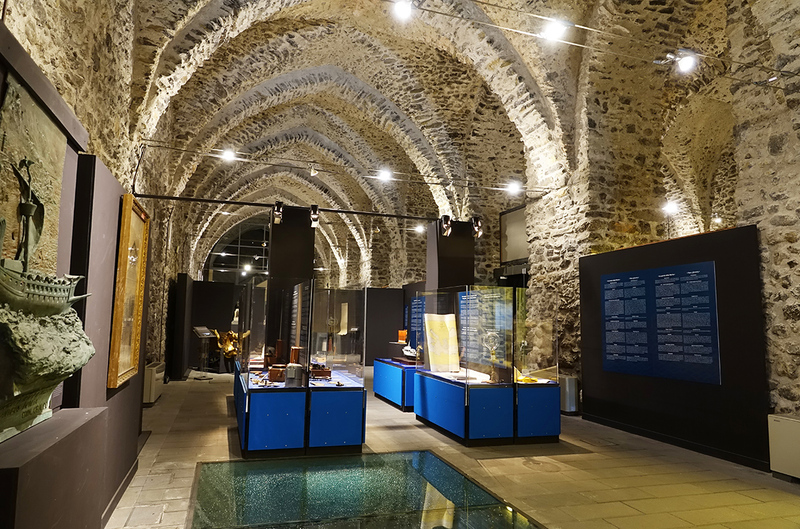 Located to the Arsenale, the impressive vaulted stone halls where Amalfi's ships were once built, the "Museo della Bussola e del Ducato Marinaro di Amalfi" (Musuem of the Compass and of the Marritime Dukedome of Amalfi) is dedicated to the city's rich seafaring history. Pride of place is occupied by the Codice Foscariniano, a 17th century compendium of nautical rules and history that contains one of the earliest examples of the Tabula de Amalpha. These 66 chapters of bylaws and rules, drawn up in Amalfi between the 11th and 14th centuries, represent the world's very first international maritime code, which contineud to act as the common law of the High Seas until 1570. Among the historical oddments are various antique nautical instruments, some passable paintings by local artists, and traditional costumes for the Regata Storica delle Quattro Antiche Reppubliche Marinare, the historical boat race between Amalfi, Venice, Pisa, and Genova. The race itself takes place the first week in June, rotating between those four host cities. Interestingly, for a while in the 10th to 14th centuries, Amalfi minted its own money from the Ducal papalce. A few of these tarì are on display. They were officialy worth 1/4 a dinar, or a Byzantine coin, and were made of 12 carat gold. For a sense of value, in the 11th century a pergola of vines outside Ravello cost 15 tarì, a three-story seasisde house in Amalfi cost 3.000 tarì, and a commercial sailing ship was valued at 4,000 tarì. And then there's all the fuss about the compass. Infact Amalfitani mariners were the earliest European adopters of this well-documented, thoroughly Arab navigational innovation.